Whatchu doing sitting on my flag Hummy? Just don't dive at my head any more. we were about 2 feets apart. Wow... that is really CLOSE UP and Pawsonal there Lily. Good thingy my bride Penny wasn't there... she CATCHES BIRDS. WOW!! 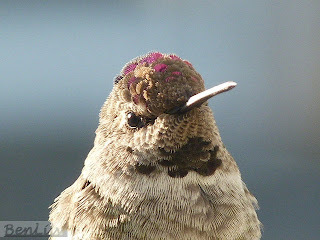 Your very own hummingbird, how cool is that??? Wow Lily, I never even saw a hummy stay still for that long. Those pics of him are amazing! Wowzer, I didn't know those birds could sit still for that long...Hummy must have been admiring you! That is a good picture you got! Maybe the hummingbird was trying to figure out if you're some kind of beautiful exotic flower!! Two minutes!?! 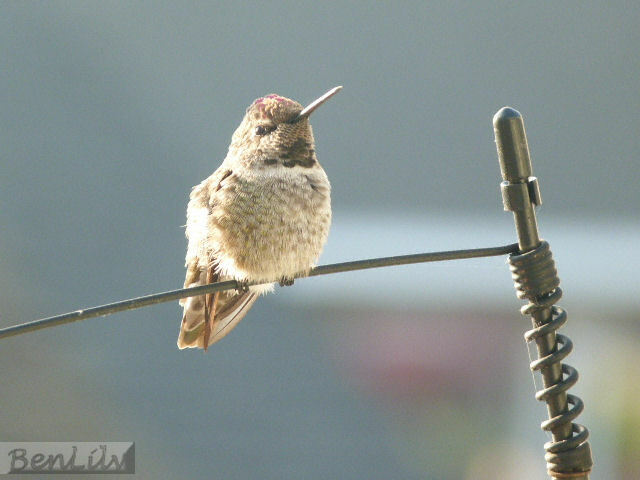 I don't think I've never seen a hummingbird sit still for that long. Great shots, and such a pretty bird. Thanks for sharing. Those are some great pictures Lily. Hummy must have thought you were awfully pretty to stay and watch you for so long! Tell Hummy to keep his beak to himself. Oh, WOW! Those are incredible pix!!! You know why hummingbirds hum, right? 'Cuz they don't know the words. Ha roo roo roo! We had a hummer at our house once. He only stayed for a couple of days. We miss our hummer! Oh what wonderful pictures Lily! That is so great that you have your very own Hummer and she has you! Aww the little pink feathers on it's head are so cute! You wasted two minutes staring at it when you could have turned it into a snack?! Lily, listen to the call of the wild! P.S. It is very pretty! Your human did a great job of capturing it to share it with us! Awesome photos!!! I don't think either of us could stay still and quiet for 2 whole minutes with a birdie that close to us! Wow Lily...good job not bitey facing that hummy!!! Gee, you stared face to face for 2 minutes. Your hummys and my hummys, do not look the same at all. What cute little hummy. Cute little you! OoOoooooohhhhhhhh, your birdie is so cutes Lily. I never get close enough to know if my birds are cute or not because I tend to chase them! You made a new friend, Lily - a very pretty one! Yes, it looks like you made a new little friend! Wow, you have your own personal, private hummer?!? That's so cool! I have lots of hummers here too, but they don't seem to be interested in me at all...hmph. Yours is so pretty! Great pix. 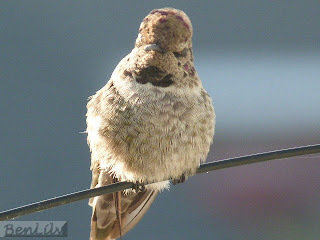 We have a hummy bird feeder & last year we had tons of hummy birds. This year we haven't seen one! I'm glad you got to see one. Awwws, you have such a cute little birdie! I have lots of birdies living in our backyard trees, but they never come close enough for me to... chase them! Teehee! So cool! We don't know if we could look at Hummy for that long.